>Rather than confront poverty by extending jobless benefits to the long-term unemployed, endorsing a higher minimum wage, or supporting jobs programs, conservative Republicans are taking a different tack. Lie #1: Economic growth reduces poverty. "The best anti-poverty program," wrote Paul Ryan, the House Budget Committee chairman, in the Wall Street Journal, "is economic growth." Wrong. Since the late 1970s, the economy has grown 147 percent per capita but almost nothing has trickled down. The typical American worker is earning just about what he or she earned three decades ago, adjusted for inflation. Meanwhile, the share of Americans in poverty remains around 15 percent. That's even higher than it was in the early 1970s. How can the economy have grown so much while most people's wages go nowhere and the poor remain poor? Because almost all the gains have gone to the top. Research by Immanuel Saez and Thomas Piketty shows that 40 years ago the richest 1 percent of Americans got 9 percent of total income. Today they get over 20 percent. It's true that redistributing income to the needy is politically easier in a growing economy than in a stagnant one. One reason so many in today's middle class are reluctant to pay taxes to help the poor is their own incomes are dropping. But the lesson we should have learned from the past three decades is economic growth by itself doesn't reduce poverty. 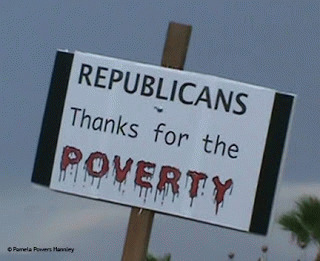 Lie #2: Jobs reduce poverty. Senator Marco Rubio said poverty is best addressed not by raising the minimum wage or giving the poor more assistance but with "reforms that encourage and reward work." This has been the standard Republican line ever since Ronald Reagan declared that the best social program is a job. A number of Democrats have adopted it as well. But it's wrong. Surely it's better to be poor and working than to be poor and unemployed. Evidence suggests jobs are crucial not only to economic well-being but also to self-esteem. Long-term unemployment can even shorten life expectancy. But simply having a job is no bulwark against poverty. In fact, across America the ranks of the working poor have been growing. Around one-fourth of all American workers are now in jobs paying below what a full-time, full-year worker needs in order to live above the federally defined poverty line for a family of four. Why are more people working but still poor? First of all, more jobs pay lousy wages.